Doesn't a Bermuda Bay Pool Party sound like fun right about now? You know, sum-mer-time . . . Cool and refreshing . . .
A great summertime color combo actually is Pool Party, Bermuda Bay and Whisper White. Crisp and clean. 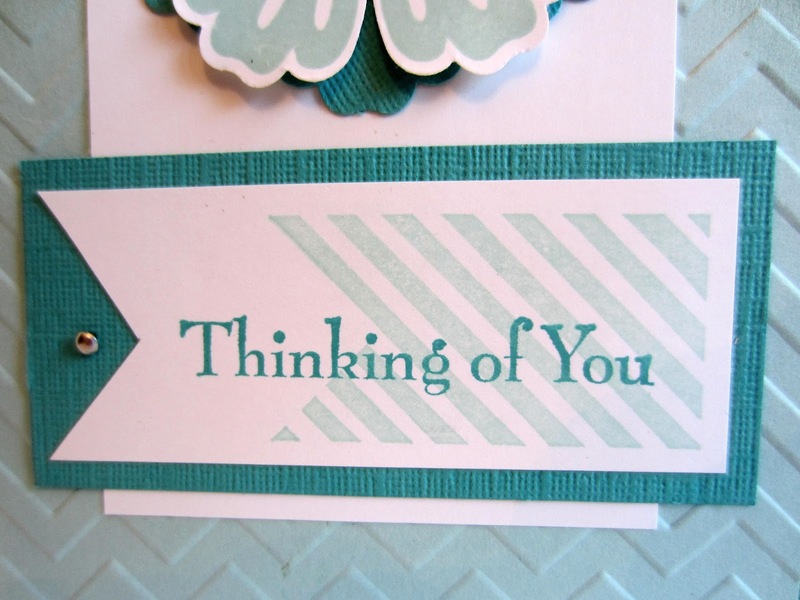 Combine this combination with chevrons and the blossom punch and stamps for the perfect anytime card. By punching out not only the stamped Mixed Bunch flower, but also another from Bermuda Bay cardstock, and staggering the petals of both punched flowers, it gives the flower a little more body and interest. The 1/8" silver mini brads add just the right amount of subtle bling. And the chevron stamping on the oversize banner echoes the chevron in the background embossing. Fold a 8 1/2 x 5 1/2" piece of Whisper White cardstock in half, creasing well with a bone folder. Adhere a 4" x 5 1/4" piece of Bermuda Bay cardstock to the card front. Run a 3" x 3 3/4" piece of Pool Party cardstock through the Big Shot inside the Chevron Embossing Folder. Adhere this over the textured paper, leaving equal borders on the sides and bottom. Add a 2 1/2" x 4 1/4" piece of Whisper White cardstock about 1/4" from the top of the Bermuda Bay piece. In Pool Party ink, stamp the striped flag with an even border on the right, top and bottom on a 1 1/4" x 3" piece of Whisper White. Add the sentiment in Bermuda Bay ink over the stamped flag. About a half inch from the unstamped end, lightly pencil a dot in the center. 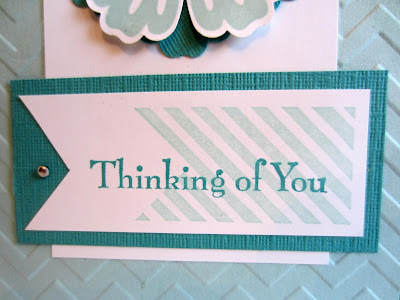 With Paper Snips, cut from each corner up to the dot to mimic the flagged end of the stamping. Add this piece to the 1 1/2" x 3 1/4" piece of Bermuda Bay cardstock. With the Paper Piercing Tool over the Piercing Mat, poke a hole inside the flagged end of the white and insert a silver mini brad. Adhere this piece to the card front, being careful to leave an even edge of the white showing at the bottom. 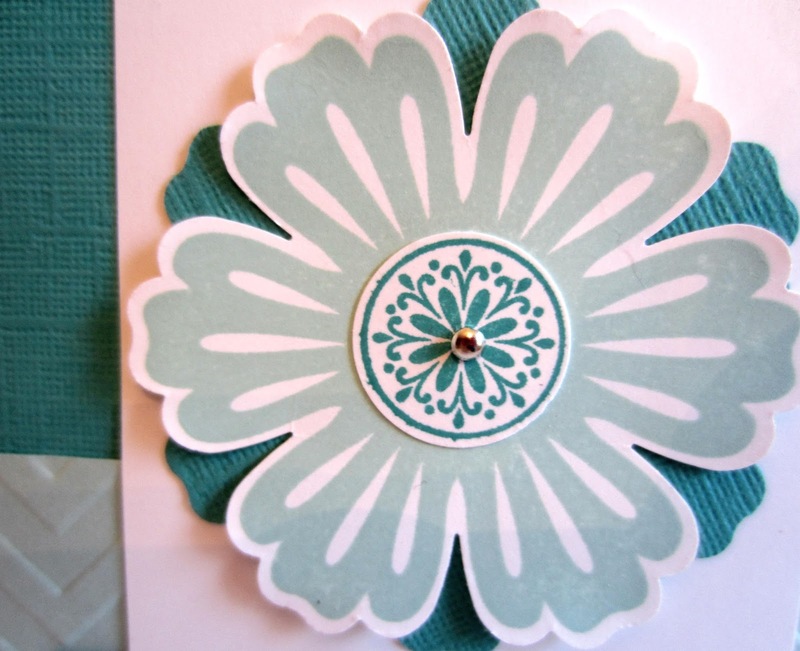 From a scrap of Bermuda Bay cardstock, punch a flower with the Blossom Punch. 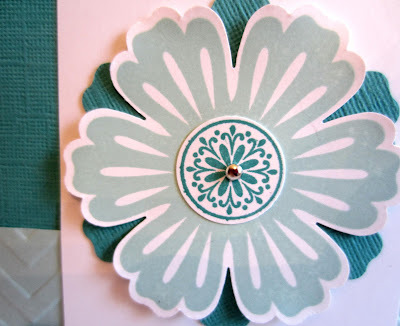 On a scrap of Whisper White cardstock, stamp the flower from the Mixed Bunch stamp set in Pool Party ink. Punch it out with the Blossom Punch. On a scrap of Whisper White, stamp the circle center in Bermuda Bay ink. Punch this out with the 3/4" Circle Punch. Adhere all these pieces together, staggering the petals of the two flowers. With the flower lying on the foam mat, pierce a hole in the center and insert a small silver brad. Use your fingers to slightly lift the petals of the top flower. 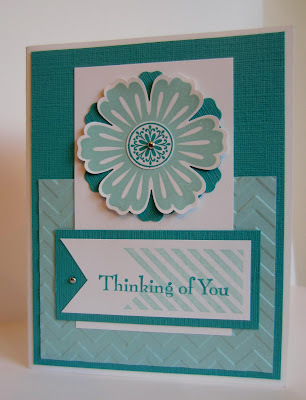 Adhere completed flower to the card with adhesive of choice. Hope you have fun at the Bermuda Bay Pool Party! Two great cards here this week - you're so creative! Another pretty card! Can't wait to see you later today. I love this card and the Make A Wish card! You did a wonderful job! The 'BBPP' party sounds like the place to be right now! Liking your card very much. Oh, wow! This is beautiful too!! =) Thanks for sharing it at the Pinterest Power Party this week! This is such an adorable card Linda!! Thank you so much for sharing how you made it! It's simply stunning. This is such a pretty card. Thanks for sharing it! Such pretty "pool" colors. :D Thanks for linking up to BeColorful this week.